When America entered World War I in 1917, chairman of the War Industries board Bernard Baruch asked women to take off their corsets to conserve steel. Some 28,000 tons was diverted, enough to build an entire battleship. 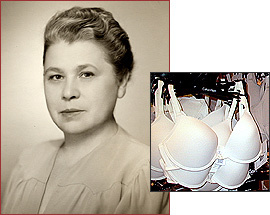 An outspoken Russian Jewish immigrant sold American women on the first undergarment that uplifted and conformed to their shape -- the brassiere. An 18-year-old immigrant from Tsarist Russia in 1904, Ida Kaganovich held socialist ideals and believed in women's rights. After breaking with an aunt and uncle in Hoboken, New Jersey, strong-willed Ida Americanized her last name to "Cohen." Two years later, she married the beau she had followed to the U.S., William Rosenthal. Unwilling to work for others, Ida bought a Singer sewing machine on the installment plan, and hung out her shingle as a seamstress. William, plagued with poor health, took up sculpting. Rosenthal's business grew during World War I, and by 1921, she opened a dress shop in Manhattan with a partner, Enid Bisset. William soon joined them. Jazz Age women were living through a cultural sea change; they won the right to vote and went to work in new jobs in factories, department stores, and offices as urban economies expanded. The Flapper look made women wrap their chests in bandeaux for a flat-chested "Boyish Form." Buxom Ida deplored the fashion. "Why fight nature?" she asked. To make women look better in their dresses, Enid and William designed a built-in bandeau with cups that separated and supported the breasts. Customers loved the brassieres, and quickly demanded them separately. By 1922, the small dress shop had registered the name Maiden Form and hired a salesman. Word of mouth brought more success, and in 1925, at Ida's urging, the partners stopped dressmaking to focus on their hot product. In 1928, they sold 500,000 bras. The company survived the Great Depression and Enid's retirement, and by the end of the 1930s Maiden Form products were sold in department stores across the nation and around the world. "I Dreamed... in My Maidenform Bra"
Ida became the management and marketing genius, with William her creative counterpart. William devised standard cup sizes, along with the first maternity and nursing bras. Ida managed the company's finances, manufacturing, and sales. She bought ads, negotiated with unions and introduced assembly-line production. They built loyalty by continuing old styles as they introduced new ones, and made sure a wide array of retailers carried their line. Most importantly, they built the brand name with racy ads that debuted in 1949, featuring photographs of women in bras. The "I dreamed... in my Maidenform bra" campaign ran successfully for 20 years. William died in 1958, but Ida remained at work until she suffered a stroke in 1966. She died of pneumonia in 1973, leaving the multimillion dollar family company to her daughter, Beatrice.